Nascar driver Ryan Newman put out a message on his facebook page that asks fans to tell Congress that they support the U.S. Army’s involvement in motorsports. The plea is in response to an amendment being proposed by Minnesota Representative Betty McCollum that, if passed, would ban the military from spending money to sponsor NASCAR race cars through Sept. 30, the end of this fiscal year. 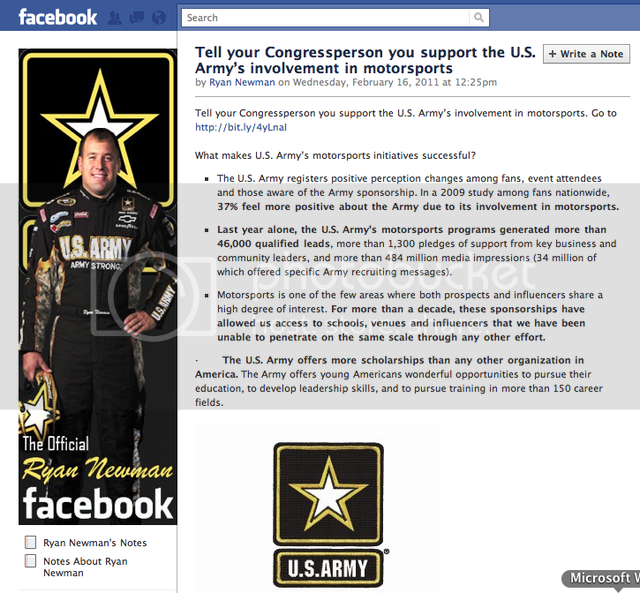 In his Facebook message, which already has about 200 'likes', Newman explains the U.S. Army's involvement... "For more than a decade, these sponsorships have allowed us access to schools, venues and influencers that we have been unable to penetrate on the same scale through any other effort." Learn more about Newman's effort to save the U.S. Army's participation in sponsorships here.